Patrick Snow, the bestselling author of Creating Your Own Destiny and The Affluent Entrepreneur, has done it again, and this time, he hits it out of the ballpark. 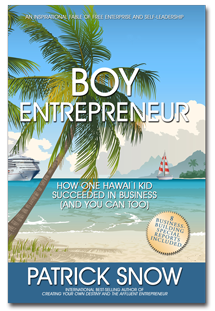 Boy Entrepreneur is the perfect book for anyone who wants to take charge of his or her destiny by owning a business�from the eight-year-old girl with a lemonade stand to the second or third career adult wanting to be self-employed. Reading Boy Entrepreneur is equivalent to having personal one-on-one sessions with over two dozen of the world's greatest thinkers in business and in life. I won't reveal who all those people are, but they range from Zig Ziglar to Mother Teresa, and they all make appearances in this charming but poignant fable about a young Hawaiian boy, Ikaika Marks, who wants to earn enough money to join his team for a baseball tournament in California. Kaika, for short, decides that since his mother and grandmother can't raise the money for his trip, he will sell makau fishhook necklaces to the tourists who visit Hawaii. He hopes to make a few hundred dollars, but what he gets instead are priceless riches, not only in dollars (though he gets quite a few of those through his sales) but also in the practical advice and inspiration he receives from the many people who stop to encourage him in his business pursuits. And while author Snow calls Boy Entrepreneur a fable, it is no fairy tale. Kaika earns everything he receives through hard work, dealing with rejection, perseverance, and thinking outside the box. And before he knows it, he realizes that while he enjoys baseball, he enjoys being an entrepreneur even more because it is the best solution for making all of his dreams come true. Readers of all ages will be inspired by this book and return to it again and again so that they can remember and apply the advice given. Young readers will enjoy this story of Kaika and his close friend, Leilani, (whom he secretly has a crush on) because it will teach them that kids just like them can succeed. Older readers will enjoy trying to guess the identities of all the famous people who mentor Kaika along the way. (All their names are revealed in the end after Kaika does a little research on them for a homework assignment.) As a taste of this great advice Kaika receives, one mentor tells Kaika, �The difference between winners and losers is that winners show up expecting to win, while losers show up hoping to win!� Kaika takes this advice to heart and continues to show up to sell his makau fishhook necklaces until he succeeds in his sales goals. Besides the entertaining story of Kaika, Patrick Snow offers numerous practical tools and exercises for readers who want to begin or improve their own businesses. Snow shares his own story of how he went from selling newspapers door-to-door as a kid to becoming the world-renowned speaker, publishing coach, and bestselling author that he is today. The back of the book is filled with tips and secrets for budding entrepreneurs, including �50 Greatest Sales & Marketing Secrets for Entrepreneurs,� �15 Start Up �Must Dos' to Succeed in Traditional Business,� And �50 Home-Based Business Ideas for Less Than $500.� All of this information will inspire and assist readers in turning their entrepreneurial dreams into realities. Boy Entrepreneur is the perfect gift for anyone, male or female, young or old. It would especially make a great graduation gift or retirement (from first career) gift. It's a book that has its priorities straight, not only encouraging people to create their own businesses, but also reminding them about the importance of helping others, valuing one's family, and giving back to the community. It's a book everyone in business should read, and a book whose standards everyone should hold business leaders to. Best of all, giving others this book is in essence giving them a fishing pole so they can learn to fish for themselves. I wish I had read this book when I was a boy and first trying to figure out what I wanted to be when I grew up. Even now, being self-employed myself, I gleaned many helpful hints from it. I'm absolutely certain that it will make a huge difference for any enterprising person, young or old, who reads it. 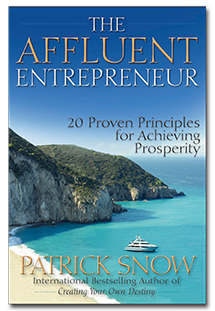 The Affluent Entrepreneur by Patrick Snow more than lives up to its title in multiple ways. While "affluent" is generally used to mean "wealthy" in terms of money, Snow expands that title by showing how all aspects of our lives can be affluent when we follow our passions, remain focused upon our families, and use practical steps to create businesses that will provide us with the money, security, and happiness we need to thrive in life. Snow also quotes the Bible to make it clear there is nothing wrong with being prosperous, and we should not let self-limiting beliefs hold us back from making the world a better place�in fact, true Affluent Entrepreneurs not only enjoy their success but share their prosperity with others through giving both time and money and by setting an example of hope for others. Snow breaks down his book into "20 Proven Principles for Achieving Prosperity" and those principles are definitely proven. There is not a bad principle in the list. Just a few of the principles include "Building Income Security," "Participating in Mastermind Groups," "Getting Your Family's Support," and "Developing a "No Matter What" Mentality." While many of these principles are basic common sense, or they have been discussed in other books, what is so valuable about The Affluent Entrepreneur is that Patrick Snow is a creative genius when it comes to being an entrepreneur. He takes these principles and provides personal and creative examples of how to use each principle to achieve prosperity and success. I've read many other self-help and business books, but Snow's presentation and stories of how he achieved success often kept me on the edge of my seat and ready to cheer for him, whether he was landing a publishing contract or being hired as a public speaker for a major corporation's annual conference. An added benefit of The Affluent Entrepreneur is that Patrick Snow does not only tell his story, but he provides in each chapter the profile of another Affluent Entrepreneur who successfully, through hard work, determination, and creativity, not only made millions or even billions of dollars, but also revolutionized his or her industry. Examples range from nineteenth century legends like Andrew Carnegie and John D. Rockefeller, to twentieth century legends like Henry Ford and Sam Walton, and to people today living the lives of Affluent Entrepreneurs including Oprah Winfrey, Martha Stewart, Donald Trump, and Ralph Lauren. With the examples of these twenty Affluent Entrepreneurs and Patrick Snow included, any reader will be sure to find the information necessary to achieve all his or her dreams of prosperity�because the Affluent Entrepreneur of the title is, after all, not Patrick Snow but the reader. Finally, I wish to testify here that I myself have Patrick Snow to thank for leading me down the road to becoming an Affluent Entrepreneur. I first met Patrick Snow in April 2007. After spending just one evening together, we came up with a business plan that resulted in my starting my own business as an independent book reviewer, freelance editor, proofreader, and writer, which ultimately became Superior Book Promotions. Within a month, I was working for myself while still keeping my day job. By January 2009, I had created such a demand for my services that I made the frightening, risky decision to quit my job and work full-time doing the work I love to do and being my own boss. Since that time, my annual income has more than surpassed what I earned at my day job. I am my own boss, set my own hours, love my work, and best of all, I am helping other people succeed in their dreams to become published authors. I like to think I would have gone down this path regardless, but meeting Patrick Snow kick-started me in the right direction by making me realize it was time I got a return on my investment of hard work and higher education. And it should be noted that I accomplished this goal despite the United States being in its worst economic crisis since the Great Depression. I am a living example that Patrick Snow can teach you how to build a business that is recession-proof because it is your own and your vision is the guiding force behind it. It is not an exaggeration to say that Patrick Snow has been one of the most important influences in my life, and I am confident that multitudes of his readers�many of whom have already learned to follow their dreams from reading his first book, the international bestseller Creating Your Own Destiny�with dedication and the courage to apply the principles he teaches in The Affluent Entrepreneur, are bound to become equally impressive success stories. The most inspiring and practical business book I've read since The Four-Hour Work Week, Patrick Snow's The Affluent Entrepreneur is filled with stories to make you laugh�and Patrick Snow isn't above laughing at himself�but after the laughter fades, you will be left with shrewd advice that will keep the brains in your head spinning until you succeed in becoming the Affluent Entrepreneur and living the affluent lifestyle you deserve. For more information about Patrick Snow and The Affluent Entrepreneur, visit www.PatrickSnow.com. Patrick Snow’s Creating Your Own Destiny is the most energetic and inspiring book written about fulfilling your dreams and finding true happiness in life. While thousands of self-help and motivational books exist in the marketplace, this book should be at the top of the list for everyone who wants to improve his or her life. I have had the incredible honor to talk to Patrick Snow in person and to hear him speak in public, and I can truly say he is the genuine article, a man whose energy and incredible gift of vision can help you succeed, a man who truly wants each of us to create our own destinies and choose to live the lives we deserve. Creating Your Own Destiny breaks down the achievement of your destiny into four steps: Dream, Plan, Execute, and Soar. Patrick Snow takes the reader through each of these steps, beginning with dreaming or visualizing what the reader wants because “Only those who can see the invisible, can achieve the impossible!” Snow provides numerous exercises and thoughtful questions to help you decide what you want out of life, and he gives extensive details on how to achieve these goals. He reminds us it isn’t that people plan to fail but that they fail to plan which causes them to be stuck in jobs they hate while living paycheck to paycheck. To back up his program, Snow provides numerous examples of people who have become successful, and he lists many resources beyond his book, which include his own coaching services, Creating Your Own Destiny University, many other books, websites, and professional services to help you achieve your dreams. One of the key points Patrick Snow focuses upon is how over fifty percent of people are unhappy at work, and how the corporate 9-5 model no longer provides security for workers. He enforces the importance of having multiple streams of income, and he teaches the reader how to create these multiple streams of income by following his passions rather than working a job he hates to make an employer rich. Snow advocates self-employment, emphasizing that the only way a person will truly be rewarded for his talents is to own his own business. His chapter on using the Internet to grow a home-based business is one of the best resources I have ever read for Internet marketing. Snow gives examples of how to execute your plans a little everyday, so over time you will succeed. I especially liked his suggestion to plan as if you only had thirty days left to live so you have a sense of urgency to create your destiny. He also emphasizes that happiness is not just about money and that we must also make time to nurture our health, spend time with family, and follow our higher calling. What I find most impressive about Creating Your Own Destiny are the examples of real-life people Patrick Snow uses, especially examples from his own life. The reader may be tempted to say, “Sure, Patrick, it’s easy for you to tell us what to do; you’re already successful.” But Patrick Snow has had an incredible journey that led him to his success. Throughout the book, he bravely shares many details of his life—how his dreams of playing college football were destroyed by an injury, how he has been laid off from work, how he has had his utilities turned off for non-payment and how he nearly lost his home; despite these difficulties, he never lost sight of his vision to succeed. He is now one of the greatest motivational speakers alive today, and his book has sold over 100,000 copies worldwide. Most importantly, he talks about overcoming fear and self-doubt; what a loss to the world if he had let his fears prevent him from writing this book, a book thousands have declared to be a great inspiration to them. I highly recommend Creating Your Own Destiny. I do not doubt it will be a classic in the field of self-help and inspiration beside Think and Grow Rich, The Power of Positive Thinking, and Ask and It Is Given. I also recommend the reader visit Patrick Snow’s website www.CreateYourOwnDestiny.com where he provides several free worksheets and resources to help you achieve your goals. You can even listen to one of his remarkable motivational speeches. If you want to live a happier, richer, more empowering life, go out and buy this book! International Book Reviewer for Superior Book Promotions. Can We Really Shape Our Futures? Patrick Snow Thinks So! "Creating Your Own Destiny: How to Get Exactly What You Want Out of Life," written by Patrick Snow, is my favorite self-improvement book this year. Such praise proffered is saying a great deal because my blog, �Helpful Books� [http://helpfulbooks.wordpress.com] reflects my very choosy appetite. As a Doctor of Philosophy in Psychology and Religion, I fancy myself able to separate the bogus self-schleppy, New Age fluff from the wisdom of the ages. I can tell when a person is pushing candy and when they�re sharing real life experiences that offer authentic encouragement to the reader. "Creating Your Own Destiny" is of this latter ilk. All 16 chapters are chock-full of wisdom (both ancient and �kitchen-table�)�most of it drawn from Snow�s direct experience as an employee, husband, father, son, and entrepreneur. He also mines his favorite inspiring quotes from those admirable people he�s tried to emulate (including his own parents). Snow is a formidable optimist and a transparent truth teller; he shares what works and the exact techniques he�s used (and still uses) to thrive as an author, speaker, book coach and business consultant. Like those other �Honest Abe�s� in business�Stephen Covey, Martha Beck, Brian Tracey, Warren Bennis, Oprah and Laurence G. Boldt�Snow isn�t �selling� this idea of �creating your own destiny� as if it�s easy. He testifies to how hard won it is to be diligent in your aim to �follow your heart�s desires.� He humbly describes his own sense of failure and the lessons that came all along the way. It is clear to the reader that Snow is a person of integrity, fairness, service and faith. One cannot help but feel his passion for giving away his secrets of success�specific methods from his own past achievements and current dreams. All of what Snow makes plain throughout this book reiterates these four winning elements of uncovering your destiny: Let yourself have a vision (dream); Put it down on paper within a realizable time frame (plan); Step up to the plate and live into the dream, (execute); and reap the benefits of your hard work and tenacity (soar)! Snow believes in his principled technology because he has been experiencing its benefits ever since he was a young man. His father encouraged him to write down what he wanted to see happen in his life (to check back in on them and be grateful for the miracles that follow). This method has been working for him ever since. Snow clearly believes that his most profound learning has come from clarifying his aspirations, overcoming his greatest challenges�including what the naysayers may say�and getting clear on who it�s all for. His ultimate motivator is adding to the wealth of love embodied in all his relationships�especially his immediate family). Many people gripped by financial fear and psychological insecurity do not think �family first� when it comes to creating wealth or insuring happiness (in fact, the pursuit of �abundance� can be such a red herring for the rotting fish in one�s personal life). In fact, when one looks to Wall Street, popular culture, or even the outgoing administration, we can see that principled solutions to most of our current crises are perceived as a thing of the past. 1. Unique questions about your direction, priorities and past practices and room to fill in your own answers. 2. A plethora of wonderful quotes to inspire the reader�I�m talking more than 321 of them. 3. Humor and humility in equal measure. 4. Honesty about the marketplace and the greed and ignorance that can rule when profit comes before people. 5. Placing one�s priority on happiness within relationships, not just as a �successful� individual. So many �self-help� books begin and end with the �self� thus fueling the unhappy illusion that we are rocks, islands, and legitimate narcissists. 6. Though Snow is a �born again� Christian, he doesn�t push what guides him in a religious sense. His advice seems to come from an open mind, one committed to leaving readers to find their own understanding to �destiny� and purposeful living. 7. He urges those who want to make money to look at their spending, saving and investing habits and asks readers what they believe �more money� will do for them. I love the idea that people who make more money often spend more money and feel just as fearful about money-lack as the rest of the middle class. Money smarts doesn�t necessarily come along with a better income. 8. Though Snow is an optimist, in no way is he na�ve. He has clearly suffered many losses: his childhood home was nearly burnt to the ground, his agility after a back injury at 18, his dream of playing football in the NFL, his first few jobs after college, a custom-designed dream home (in order to get out debt); and hearing initial reviewers of his CYOD manuscript tell him, �Don�t quit your day job, you�ll never make it as an author!� I�m sure he�s laughing his way to the bank after selling more than 125,000 copies of this book (now in its 9th Edition). 9. His nature as a person comes straight through his inspirational writing. He is clearly a person of great character � true blue � not just red, white and blue (though he is that, too). 10. He values loved ones and knows he would not be here without those special mentors, teachers, leaders who�ve paved the way. Snow is clearly driven to make the world a better place by having more �enlivened-by-their-work� human beings truly living in it. As you might have guessed, I strongly recommend this book and so do his readers�some from Nairobi, Thailand, Vietnam, Mexico, Pakistan, India and Iraq. This book has been translated into many languages and appreciated by people of all ages. It seems the perfect time to get inner direction, regardless of your context. The sweeping changes in North American society would give any conscious person pause when considering positively affecting their future. Yet, the notion of counting on a secure marketplace or reliable employment is even more fanciful. Asking ourselves Snow�s important questions could not be more relevant for the 21st century. That his writing speaks to so many people outside the U.S. tells us that these principles are universal, timeless and enduring. Snow did not invent his recommended methods nor does he take credit for them. He�s simply identified, experimented, and organized them into a framework that nine to 109-year olds can test for themselves. Creating Your Own Destiny is an insightful �how to� guide full of keys to help you take charge of your own destiny. It is touted as the definitive guide to ��more health, more love, more happiness, and more freedom to do what you want.� Patrick Snow has created an easy to follow �roadmap to success� for high achievers to start living their lives with intention, direction, and success. Snow, a highly successful speaker, coach and entrepreneur, has crafted this book around the experiences and observations of his own personal growth and development as a business owner. Based on the premise that there has to be a healthy balance between work, family, and personal life, Snow has produced a work that can be used as a compass for others to follow. The straight from the hip advice he shares is easy to follow and implement on a daily basis. The exercises in the book help the reader to finally articulate what they want for their own personal destiny and then to visualize their dreams in terms of how to make them achievable. Creating Your Own Destiny teaches the reader how to set big goals that are not only measurable but serve as a way to provide clarity and direction for their life. Realization of goals, according to Snow, �gives you a sense of satisfaction and a stronger belief that you can meet your other goals.� The book stresses the importance of goal setting so the reader has a crystal clear image of where they want to go and what they really want out of life. The cornerstone of the plan set forth in Creating Your Own Destiny is there must be a good balance between family, faith, wealth, and health. Through careful introspection and active participation in the reflective exercises, this book guides the reader to dream, plan, set goals, and craft some of the financial and motivational groundwork that will help them take charge of their life and chart their own destiny. This book assists the reader in developing their own personal road map for successfully attaining those goals and to ultimately achieve their destiny with triumph. Through stories, quotes and a unique approach to the topic of motivation and success, Snow has managed to create a winning formula for producing and executing a winning plan for personal fulfillment. This book offers powerful methods to help the reader dream big, really, really big and then provides common sense techniques to guide making those dreams into reality. Patrick Snow is a focused guy. He was one of the few young people making goals when he was yet a teenager: He was determined to become a professional football player. When this dream evaporated after a career ending rib injury Patrick changed his path and changed his goals. Patrick became determined to become a professional speaker and a successful self help coach. After graduating the University of Montana he found himself in the Pacific Northwest with the love of his life and a career in corporate sales. But his goal of being a successful speaker wouldn�t wait. This book grew out of that dream � and a hope to leave a roadmap for the author�s sons to follow in their own careers. If the book has any drawbacks it is that many of the inspirational quotes that Patrick uses in his book can be found in a plethora of other self-help books. But as I mentioned, I think the strength of Patrick�s program is in the fact that he lays his own path out for the reader to see just how he got where he is. Patrick shows what it took to live the life of his dreams and he shows the reader how this relates to him. I recommend Creating Your Own Destiny to anyone who wants to do just that.